This is no scientific test, but it is amusing. What if you were a famous celebrity? How accurate is the Internet’s information about you? What if you could sit said celebrity down in front of a laptop and go through Wikipedia, Internet Movies Database, fanboy sites, anit-fan sites, fan-fic boards, YouTube, celebrity sightings, the whole nine-yards, and get confirmation or not for the facts? Can you believe anything the Internet says? AJ Jacobs (one of my favorite magazine authors) performs just this test with “sexiest man alive” George Clooney in the current issue of Esquire. It’s a very funny exchange. Jacobs didn’t supply a final score for the internets, but I would estimate it is a C minus. 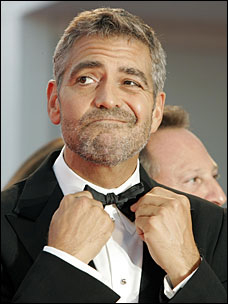 Clooney is not gay, not running for Vice President, not planning to wed in a few months, as the Internet Tubes say. But a great deal posted about his life is accurate, probably more than I expected. I would say that the Internet was about as accurate as I expected. I was surprised — and I guess I shouldn’t be, having spent 15 years in journalism — by how inaccurate the articles from the mainstream newspapers and magazines were. Not much more accurate than the wikipedia-type sites. Also, I’ve come to rely on the wikipedia a huge amount in my every day life. I generally figure that about 80 percent of each entry is accurate. Clooney’s wikipedia entry seemed about 70 or 75 percent accurate. So maybe just a tad below my assumption. I found a fascinating type of vandalism I hadn’t heard of before. There’s a line in Clooney’s wikiepdia entry that says ‘He secretly financed a thriller called Endgame Study.” Clooney had no idea what that was. I did some research and found it was an obscure low-budget thriller. Apparently, the producers wanted some exposure and a link to a Hollywood star, so they (or someone on the film) just inserted the movie into Clooney’s entry. And they used the word ‘secretly,’ which was brilliant.